For the best investment for retirement, the top 3 answers were Real Estate, Time Deposits and Savings. There were very few respondents who made mention about more sophisticated instruments like life insurance, mutual funds, unit investment trust funds, stocks, bonds or structured notes. Ironically, quite a number of my respondents came from financial-related industries. If my respondents are an indication of the average middle class Filipino, you can surmise that we remain to be largely unsophisticated when it comes to investments. It is no wonder our capital markets are still highly undeveloped with most of the funds invested in short term savings and time deposits. My 9th question actually reveals my theories on retirement planning in the country today. When asked why they think Filipinos do not take retirement planning seriously – my respondents talked about immediate gratification; ‘manana’ habit; lack of funds; poor income; increasing expenses; wrong priorities; short-term thinking; lack of knowledge; etc. Here’s an interesting reply from one of my respondents – “This is a big challenge for us in the financial industry. Filipinos are not too keen on preparing for their retirement maybe because of what we call the ‘extended’ family. Further, most parents are too busy preparing for their children’s future and they tend to forget to prepare for their old age. They will simple say, if I can provide a good future for my children they will look after me during my old age.” Obviously, this respondent belongs to the financial services industry and took the opportunity to express her disappointment. 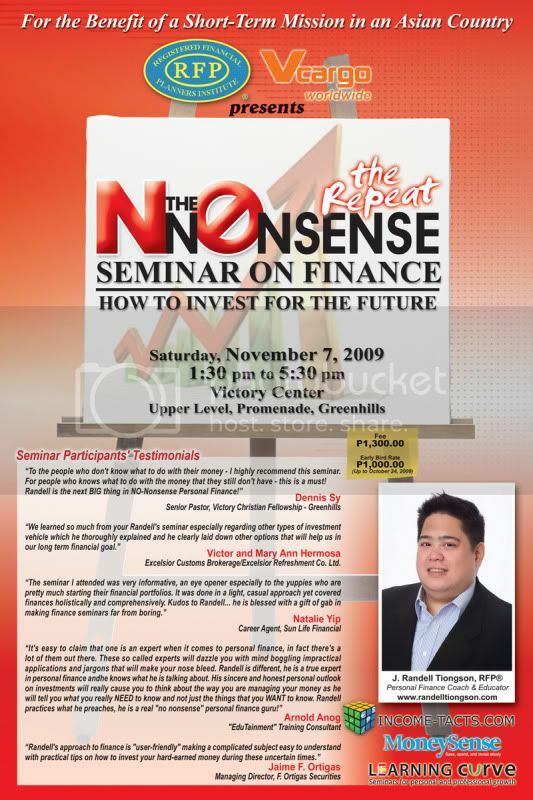 I remember hearing someone referring to it as the Filipino Financial Planning. With regard to consulting with a professional, nearly all of my respondents thought it was a good idea. At least they acknowledge the fact that they will need help in this important area of their lives. Well, seeing a financial planner is really a good start; executing what the planner recommends is another story. The response to my final question should encourage the practitioners that there are people out there who would like to at least listen to what a planner has to say. I must say that as I collate the responses, I was really concerned about the future of my fellow Filipinos. While most of our brothers and sisters agree that retirement is something that they should prepare for – actually doing it is easier said than done. Personally, my wife and I would really need to work on our retirement programs ourselves and writing this article was also a reminder for me. The Bible actually talks about preparing for the future — many refer to it as the ‘Storehouse’ Principle. Come to think of it, retirement planning is just like filling our storehouses. Let us be consistent in filling up our storehouses so that when the time comes, we will have enough supply for our needs. Retirement planning is no different – we must be faithful in allocating for our retirement so the when we do retire, we will have more than enough. Just as God blesses the storehouses in the biblical times, God will bless our financial plans as well. Remember though, if one does not have a storehouse (or a retirement program in this case), what will God bless then? Galing. Praying for your direction & your success. Yes, Randell, am too agree with the issue of planning for retirement. Financial Planning for the future especially for the aging parents is a must thing to do. It would be ideal if you start it early in your marriage life while your children have not yet go to school just what I did during my time. One practical way of doing it is to prepare a WORKSHEET for 20-year CASH FLOW BUDGET/FORECAST or CASH-INFLOW minus CASH-OUTFLOW. If possible do it on monthly basis. Define the major permanent source of revenue, amount for savings, retirement, household expenditure and buffer funds. Treat this worksheet just like a BIBLE. Any present or future expenses not included in the worksheet must not be incurred. Of course, you must have a high level of discipline in deciding when to spend and not to spend. In my case, I educate my wife (housewife) and son by giving them the copy of our BUDGET worksheet and explain to them every item in the BUDGET. Before some revision to be made in our annual BUDGET, I ask them to provide me their respective annual expenses, and I scrutinize every details of it. Removing items that are unnecessary and obtain their acceptance on the budget. Once I met the target CASH balance on every period, I ask my wife and son to stick on the budget. In this respect, everything is well define and there’s no way that you cannot meet your desire financial target in the forecasted month, year up to the life of the forecasted budget in line with your retirment plan. Thanks be to our LORD JESUS CHRIST that He provided me some knowledge on handling finances. All our future expenses and obligations are being hedged for any adverse inflation during the life of our budget.